Tip #1: Cheat! Don’t study all the warblers, just study the ones that are most likely to occur in your area. Also look at arrival and departure dates. Warbler species tend to migrate at different times, although there is a large degree of overlap. Take them one at a time, but first study the early arrivals. Tip #2: Pay attention to field marks. 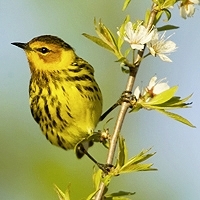 The best thing about warblers is that they are colorful, especially in spring breeding plumage – and each warbler has unique coloration and markings. Wing bars, belly streaks, facial markings, tail markings, and many other features can help you distinguish between them. Just make sure you practice using your binoculars, because these tiny birds move really fast and like flitting around high up in the foliage. Tip #3: Study behaviors. Warbler species feeding habits vary widely. For example, waterthrushes can be observed near water running along the bank, bobbing up and down. Other warblers like to "hover glean", or hover for a short time while gleaning insects off tree leaves. Still others, like the Ovenbird, like to find food in the leaf litter. Knowing where to look and what to look for is a big help. Tip #4: Use your ears. Each warbler species has a unique song that it uses to communicate. Many warblers won’t full-out sing until they reach the breeding ground, but will use short chips as their call-notes on migration. For a beginner birder, call notes may be too challenging – even experienced birders find this takes time to learn. But studying the songs of breeding warblers in your area will be helpful in identification. Tip #5: Practice with the proper tools. The most important part of birding is actually birding! Get out there and look at some warblers, even if you’re not completely sure what you’re seeing. Go birding with a local bird club and make sure you have decent binoculars that are easy to use. Having a great field guide is very important, so choose one that works best for you and take it along.